John Motson, Bob Wilson and Barry Davies were among the mourners as almost 100 friends and family members said their goodbyes to Albert Sewell, MBE, the former Hayters and BBC stalwart who passed away in June. It was standing room only at Breakspear Crematorium, west London, as a host of former colleagues joined his family to pay tribute to Albert, who was a Life Member of the FWA. The heads of sport from both BBC and ITV, Philip Bernie and Niall Sloane, were also among the mourners, along with Steve Rider. Hayters colleagues included Nick Callow, John Goodbody and Michael Hart, another FWA Life Member, who said Albert was his mentor as a young reporter in the 1960s. Gerry Cox, also of Hayters, represented the FWA. Albert's beloved Chelsea were represented by Steve Atkins, the club's director of communications, and guests heard from Dave and Graham Sewell how much their father loved the club, having covered them, written several books and been programme editor for many years. Indeed John Motson pointed out that the matchday programme, as we know it today, was transformed from a simple teamsheet into a full-blown publication by Albert at Chelsea 70 years ago this month. 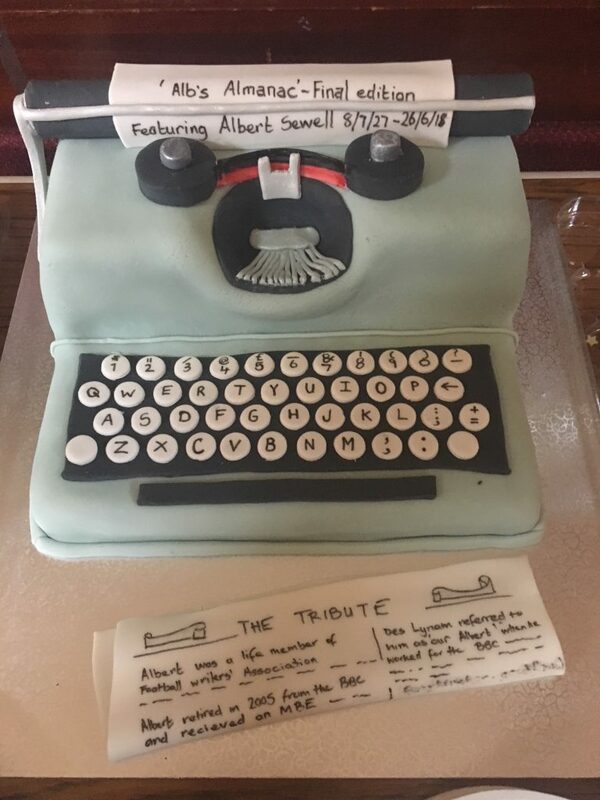 Among many lovely anecdotes about Albert, Dave recalled how his father had resisted using a computer or even an electric typewriter, preferring his manual one, so it was fitting that his cake should come in the shape of his favourite 'device'. Albert Sewell, RIP. Thank you all so much for this most fitting tribute to Dad. He always set high standards in life, and we would like to think he would have approved of his ‘send-off’ on Monday. Thank you to those who attended, and for those who couldn’t, we know your thoughts were with us. As John Motson said on Monday, Dad’s legacy to the world of football lives on in the form of virtually every football programme printed since around 1949. Not only did he change the format of Chelsea programmes by including ‘action’ photos from previous games, but also made fans feel more connected to the Club by giving them a voice in features such as ‘In Off the Post’ or ‘The Talk of Stamford Bridge’. He leaves behind a good body of work, not only in the six ‘Chelsea’ books he edited,and hundreds of Chelsea programmes, but also numerous News of the World football annuals, Playfair annuals, Observers book of Association Football (later Soccer), and many other ‘one- offs’. Dad may have appeared old fashioned to many in that his ‘spellcheck’ was the Oxford English Dictionary, and never used a computer in his life, but he always strived to be consistently accurate, and meticulous in his research. He loved writing ‘Alb’s Almanac’ a Christmas treat for those of us lucky enough to be sent a copy every year, and indeed had already prepared twenty pages for the next Almanac. Thank you all once again. RIP Albert.